Rubber B is the first company to design a customized range of rubber straps to perfectly fit specific Rolex watch models, perfect for individuals with active lifestyles,looking for a unique alternative to metal bracelets and leather straps. Rubber B is the newest and only rubber strap designedspecifically for Rolex watches. Perfect for sports enthusiast or the fashionista sitting by the pool. Rubber B is the first company to design a customized range of vulcanized rubber straps which are constructed to perfectly fit specific Rolex watch models, opening the door to individuals with active lifestyles, who may be looking for a unique alternative to metal bracelets and leather straps. Vulcanized rubber provides superior resistance to wear, stretching and damage from environmental elements (Ozone, UV, and harsh aquatic conditions). The result is supreme flexibility and durability against damage or tearing, encouraging a long life without deformation from active wear. 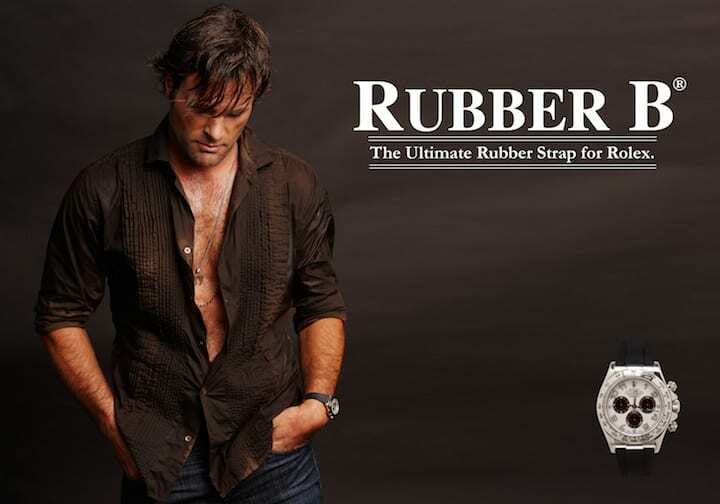 Rubber B is an American company with production in Switzerland. The Swiss production team has succeeded in engineering a precise design which harmonizes with Rolex watch models ensuring the highest quality and reliability. Each watch band incorporate the original Rolex Deployment Buckle into their design. This allows the owner to have the flexibility and customization of a rubber strap without compromising the classic, distinctive beauty that their Rolex watch represents. Choose your Rolex model and you will be shown a selection of colors available for your Rolex.